Choosing the right cabinet hardware for your kitchen or bathroom can be tricky! It's the littlest details that will make the biggest impact! There are so many different factors when it comes to hardware. There are back plates for cabinets, hinges, catches, pulls, knobs and of course, different finishes for all hardware. So how do you know what hardware your kitchen or bathroom cabinets need and what style is best? We are here to help! 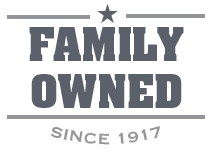 We are going to explain each aspect of cabinet hardware and help you decide which hardware will work for your home. There are different types of hinges and they are constructed in various ways to fit cabinets and create different looks. There are fully concealed and semi-concealed hinges. With fully concealed hinges only the surface of the door is outwardly visible and with semi-concealed hinges only the knuckle is visible. Semi-concealed hinges are used for inset doors. There are face frame hinges, 3/8-inch offset H hinges, butterfly hinges, T-style hinges and full-inset pin hinges. Face frame hinges work on doors that completely overlay the frame. The 3/8 inch hinge provides support for offset doors for a smooth operation. Butterfly hinges work on flush doors. There are two wings on this hinge and each mount to the outside surface of the cabinet door and frame. T-style hinges look just like its name, they look like a sideways letter “T” where the vertical part attaches to the doorframe and the horizontal piece attaches to the door. This adds a very unique and stylish look to your cabinets. The last type of hinge we will discuss is a full-inset pin hinge. These work for cabinet doors that are completely flush with the front of the cabinet. They mount recessed or surface mounted. Now that we know the different types of hinges you can use, there are some specifications on how many hinges should be on a cabinet door. The number of hinges depends on the height and weight of the door. Use two hinges for doors less than 40” high and 11 pounds, three hinges for doors 40-60” high and 13-20 pounds, four hinges for doors 60-80” high and 29-33 pounds, and five hinges for doors 80-85” high and 40-48 pounds. Now that you know what type of hinges to use and how many, you have to decide on what finish to use. You can choose from nickel, satin nickel, oil rubbed bronze, or brass. The options are almost endless on types of hinges. The options are limitless as well for knobs or pulls. There are a couple of things to consider when deciding on a knob or a pull. Knobs use a single screw and bolt and can be mounted with or without a back plate. 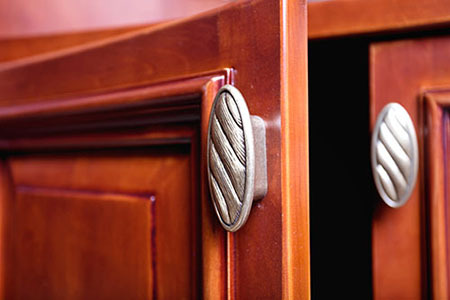 Pulls take up more space on the cabinet or drawer which can take away from the style of your cabinet. If you are just replacing a knob or a pull, take the one you are replacing to Sutherlands with you to ensure you get the correct size so it's a perfect fit!